Elijah and Jenni have a shop in the U.S. Virgin Islands called Dead Pirate Tattoo. Elijah first saw the Grateful Dead in 1980, and discovered he was home. Elijah has done many GD tattoos. He sent us 3 of his own and one from Jenni. 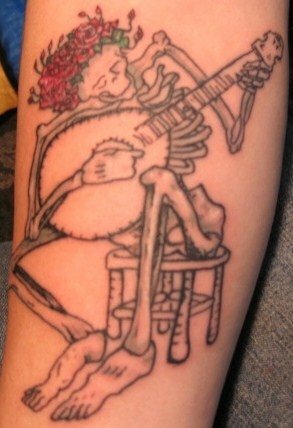 You can find their work on Facebook searching Dead Pirate Tattoo, as well as other places. Thanks Elijah.